Built for speed, mobility and aggressive traction around the field the Nike Mercurial Superfly Academy DF Junior FG Football Boots in Dark Grey and Yellow will give you the killer instinct your games been missing. These Nike Mercurial Superfly Academy DF Junior FG football boots have been engineered with a Dynamic Fit collar which helps lock your foot in place and supply a sock-like sensation, whilst the mixture of chevron and conical studs supply exceptional traction. Wrapping your foot perfectly the 360-degree construction sits snugly around the foot moulding to the foot straight out of the box, giving you the killer instinct that's been missing from your game. The revolutionary sole plate offers a split design, combining a front plate with the heel plate, ensuring flexibility and comfort when flying up and down the wings. 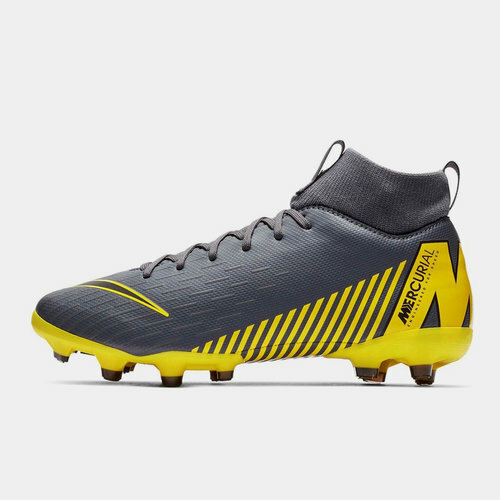 This boot is all about being lightweight, flexible and aggressive, so if you're a winger looking for killer instinct, this Mercurial is the boot for you.